When you have lovely, pristine seafood that was caught the previous afternoon from Long Island Sound, it behooves you to show as much respect as you can. That being said, I love to cook in a minimalist style and perhaps, inspire others in my own way. I think that we have become too enamored of things like white truffle oil, balsamic vinegar, sun-dried tomatoes and the newest “in” ingredient for 2012, mustard. We love them so much that we have forgotten how most foods should taste like, and in the process, lost an appreciation of their natural beauty. Place scallops in a small bowl. Sprinkle with salt, then set aside for 5 minutes. Melt butter in a large skillet over medium heat. When the butter begins to foam, add the scallops to the pan. Cook without moving them until crisp and golden brown, about 3 to 4 minutes, then flip each scallop and cook the other side for 1-2 minutes. Remove to a plate, then set aside. Deglaze the pan with lemon juice. Stir once or twice. then pour off the resulting sauce into a ramekin and set aside. Pulse green garlic in a blender or food processor until finely chopped. Add a pinch of salt, then the walnuts and cheese. Pulse a few more times to ensure that the mixture is well-blended. Pour olive oil in a thin and steady stream until the desired consistency is reached. I like my pesto with a little texture in it, while still retaining some moisture. Taste for salt and pepper. You probably won’t need much however. At this point, you can add some lemon juice or chopped lemon zest to brighten the flavor, if you like. To plate: Spoon the scallops onto a warmed serving plate. Place two quenelles of pesto alongside the scallops. 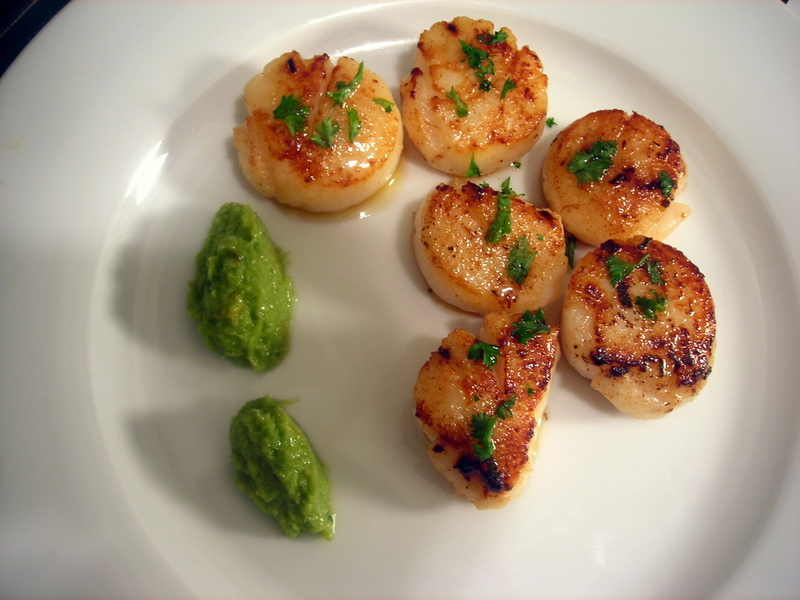 Gently spoon one teaspoon of pan drippings atop the scallops and garnish each scallop with chopped parsley. Serve at once. Time: About 15 minutes for the scallops, including prep. This does not include time spent prepping the pesto, which can take about half an hour. Pesto can be made one day ahead; keeps up to three days, covered, in the refrigerator. 11 Apr	This entry was published on April 11, 2012 at 2:42 pm. It’s filed under cooking, food, food photography, Gluten-Free, recipe, spring and tagged dinner, food photography, gluten-free, green garlic, Long Island Sound, scallops, seafood. Bookmark the permalink. Follow any comments here with the RSS feed for this post. As per usual, the photography is mouth watering, and that’s coming from someone who developed a shellfish allergy ten years ago. Thanks for reminding me how good scallops can be/picking a scab. Great stuff. Ah, sorry to hear about the allergy. I’m fortunate to not have too many of those. I am mildly lactose intolerant but not enough to curtail my enjoyment. AMAZING. Paired with Pasta and Scallops, and was absolutely divine.